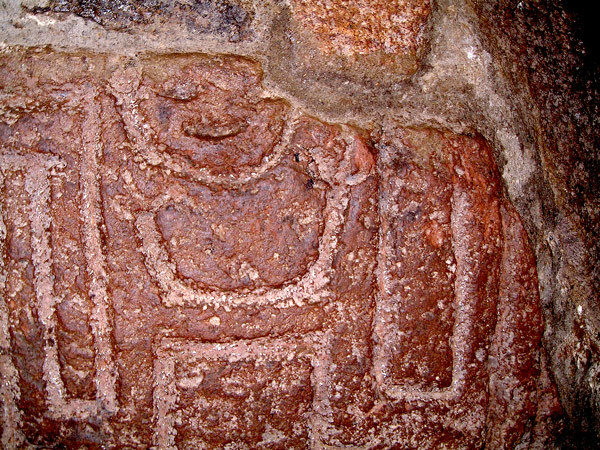 This etching, known as a petroglyph, is found inside of the Temple of Quetzalcoatl. It is unlclear what it represents, if anything, and why it was etched hidden away in the darkness. I took this photo using the camera flash in the pitch dark, hence the context is lost – as are the extremes of the image. From recollection, I hadn’t bought a torch at this point as it was only the 2nd site we had visited and we weren’t familiar with the nooks and crannies that one can explore at sites like this. Therefore, my explorations were guided by a cigarette lighter. Apparently, their are many bigger and better petroglyphs that have a known meaning – so if you do go exploring then take a torch.